Further west of the Semliki Wildlife Reserve is the Semliki National Park – distinctly separated from the reserve but confusingly sounding one and the same. The Bwamba Forest is included in this area and it is not much visited by tourists other than serious birders although there is a very good hot springs in the area. 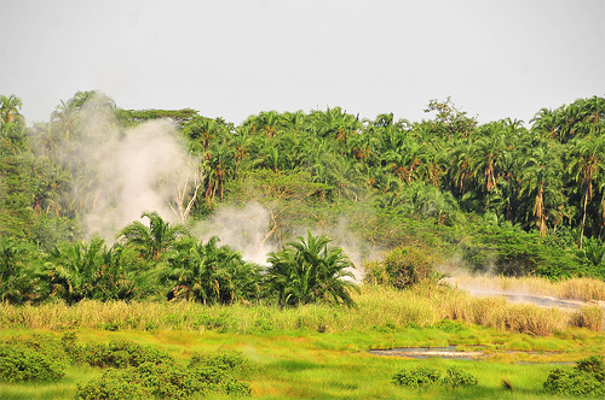 Situated on the Congolese border and bounded by the Semliki River it is a practically unspoilt tropical lowland forest. As an extension of the massive Ituri Forest which runs all the way to the Congo River, species present in the forest include lowland species found in the Congo Basin. Around 300 species of butterfly include 46 species of forest swallowtails and 235 moth species. There are over 300 tree species recorded of which 30% do not occur elsewhere in East Africa. There are almost 400 bird species of which 35 are Guinea-Congo forest biome birds. Some of these include spot-breasted ibis, Hartlaub’s duck, Congo serpent eagle, Grant’s blue bill, northern bearded scrub-robin and the Gabon woodpecker. There is not a very comprehensive list of mammals but they do include the pygmy antelope, two types of flying squirrel and six types of bat. A particularly peculiar antelope is the water chevrotain, a tiny duiker-like ungulate sharing some structural features with pigs and thought to be the predecessor of all deer, cows, giraffe and modern day antelopes! Primates are rumoured to include lowland gorilla but none have been seen. There are unhabituated chimpanzees, Brazza’s monkeys, grey-cheeked mangabey, black and white colobus and olive baboons. There are some elephant and buffalo with a small range of bush pigs, sitatunga and white bellied duiker. There is a pygmy village at Ntandi which is informative to visit but be prepared to pay for photographs. The Bambuti regularly smoke marijuana and recent concessions allow them to hunt and fish in the national park although they are restricted from hunting certain species. The oldest inhabitants of Uganda there are only around 60 Bambuti left today and interbreeding has meant all of the current teenagers are taller than their forebears.